Living on a sailboat on passage will list the things we considered essential when we were underway in our wonderful 8 years in the Caribbean. Let's talk about electronics and safety precautions. You can go see other pages on our sailboat dinghy and the anchor or ground tackle. Here we'll talk about going somewhere and doing it safely. I say these are almost essential. You could always get your weather from a buddy that has an SSB. You could also hand steer. A few did this, I would rather take it easy and lie down. You cruise to relax...right. Living on a sailboat on passage can have as much or as little actual sailing as you want. You will use the VHF radio everyday to talk to your cruising buddies. The range isn't much and the Caribbean Islands are all mountainous...OK, OK except for Anguilla and Anegada. Your GPS, at least in my case, made an inexperienced sailor into a competent navigator. It is simple, I mean really simple to get around the Caribbean. When you did go someplace, remember when cruising 99% of the time you are stationary, the autopilot and radar are rigged up. The radar just gets in the way at anchor so you take it down when you are not on passage. Turn everything on while it is daylight to make sure evrything is working. Before the anchor is pulled up make sure all is working...if it isn't don't go. Living on a sailboat on passage is common sense and some hard and fast rules for safety purposes. First, you use the SSB radio to get weather reports. Here's the nav station on board Shadowtime. The SSB is above the electrical panel. You can see the microphone for the VHF to the right of the panel. Don't leave shelter until the weather is favorable. Cruisers do not get in a hurry. What is favorable weather?... a maximum of 4 foot seas, wind less than 15 knots...so you had the motor between islands, big deal it's easy and very comfortable. You could make an exception on certain points of sail... but Murphy was a sailor, and it seemed every time you wanted to go someplace the wind was usually on your nose. If the weather isn't right don't go. One time we were waiting for weather 24 days in Martinque...not a bad place to be stuck. Living on a sailboat on passage means there is a place for everything and everything has a place. You don't want to be looking for something while moving at night. There is no room for clutter while on passage. 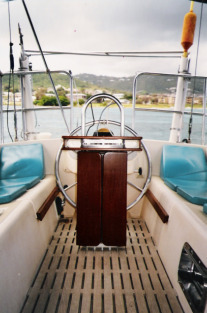 Here is a view of the cockpit, the radar and the GPS mount on brackets on top of the binnacle, the round jobber above the compass. 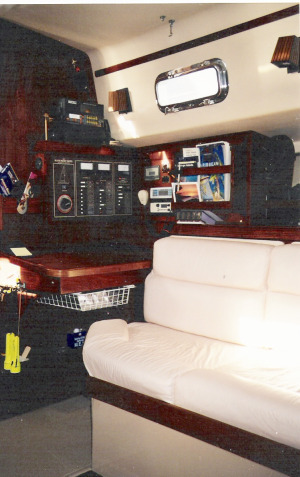 Your captain would be reclined on the picture right, boat portside cushion. The autopilot controls were right there. With the radar and GPS angled down, the captain could get his rest while keeping an eye on the instruments. A radar alarm would go off if a boat got near, 2 miles was where I kept it. The first mate slept snugly on the cockpit grate. When living on a sailboat on passage you kept safe by using common sense, being prepared and adhering to a few simple rules that kept things safe. This was a time for serious attention to be given to the boat moving. The other 99% of th etime you enjoyed yourself. As an aside the cockpit grate was made in Trinidad by real craftsmen. Teak is grown on Trinidad. It was cheap...maybe $150.